It’s almost here! Baselworld 2015, the longest running premier event for the watch and jewellery industry begins on March 19th. It’s a paradise for exhibiting companies–all 1,500 of them showcasing themselves to 150,000 attendees and 4,000 journalists. As many of my readers know, my passion is discovering and then sharing wristwatches that have an iconic quality. They exemplify classic forms with innovative elegance and simplicity. They can be modern or vintage, simple or complicated. They must first visually resonate as works of artful craft and then as technical wonders. So it is with Wonderland 2 which embodies both gravitas and grace in one design. 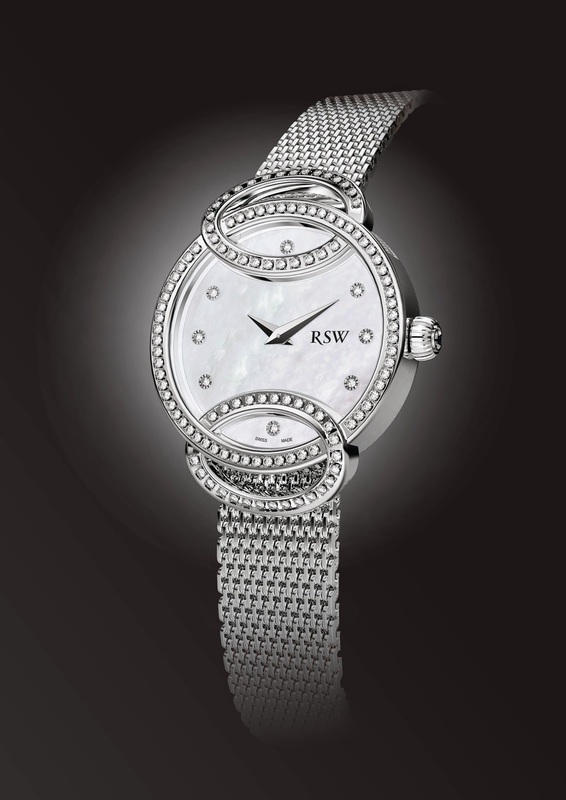 Simply put, the RSW Wonderland 2 gives us a flawless, flowing inseparability of a circular case rimmed with diamonds interlacing with complementary, oval-shaped diamond elements. Twelve o’clock and six o’clock are forever rimmed with opulence. As RSW’s Baselworld 2015 News describes it, “The circle symbolism is the wedding ring and stands for a promise or fidelity, unity.” My take is that the theme of rings and softly rounded shapes which first drew me to the brand in July 2014 is a newly inspired interpretation of the brand’s faithfulness to the fluidity of time and the promise time offers to all of us. One’s Wonderland 2 can be customized with various diamond counts and dial facings including black, champagne, rose, white and silver. The design pictured has a Mother of Pearl dial facing with 8 diamonds (0.06 ct) replacing the 1, 5, 7 and 11 o’clock indices. The case choices include stainless steel, yellow PVD (Physical Vapor Deposition), or pink PVD. All of these choices essentially mean that the case, crown, bezel etc. wear is reduced and the beauty of the finish preserved. Finally, the case can be banded by a Milanese Bracelet, a mesh strap design named after the Italian city of Milan, where they were first created in the 19th Century. Prefer, an alternative? A royal satin strap is also available. Want your own RSW Wonderland 2? RAMA Watches will be offering it through its online store, Tempus La Boutique following Baselworld 2015’s close on March 26th.